Great read Deanna, makes me happy to know I was not alone feeling that way. My 4 children are all adults now with families of there own, but I feel they are starting to see me as a person more and more as they are stretched in so many directions these days. I am also thankful to have such a pleasant new hobby to pursue. I was always wanting to be in the horse stables, my true passion, but as time he gone by my body needs a more relaxing passion. So thankful to renew those old yearnings for creative ventures with wool and paint.Thank you for all the videos and tips, a constant source of knowledge. Enjoy your time! I just read this post and am so blessed by it. You voiced my experience as a mom too. Thank you for keeping it real! I think you should submit this post to a magazine, maybe Canadian Living? It is worthy of being read far and wide. Thank you for sharing it. A mat by the back door is the perfect place to begin Carrie. 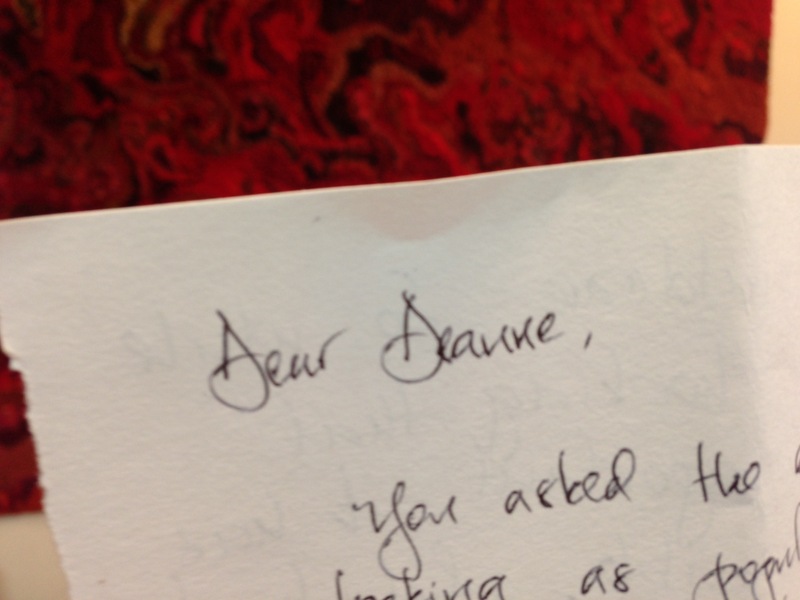 Thank you, Deanne, for the great response to my letter- and for the thoughts on mothering. I really feel that when I had a new baby- well, things got all discombobulated for a while- and discovering your work opened a door, made art/craft/ fibre so accessible to me- and now, a few years later, working with fibre has become a daily part of my life- one that has really allowed me to eke out that piece of life that is mine alone (even if only in a few moments of daydreaming about the next rug)- but that also allows me to share those creations with the ones I love the most- my little family. Yes, I’ll try and do my part to get some younger hookers going- it all can start with a mat for the back door! I agrree about the letter, so lovely. people still do that. We all need to be reminded to source out ourvown little corner. When my daughter was small I was a single parent and I too was often stretched way too thin and without partner back up there were days when I felt like I was just barely holding it together. I always hoped that her childhood memories would be of the good times not the days when I was cranky and miserable and wanted to put her to bed at 6:30 because it was me that was tired! Ah! Did you ever manage to describe the way things were for me when I was parenting my now-29 year old daughter, and the way things are for me now. I bought your book when she was still quite small and took up hooking, but only for a short time. Knitting, quilting and making Halloween costumes filled whatever time I had left after a full time out of the house job and my wife and mother activities. After my daughter moved away for college, then married and moved to the opposite coast of the US from me, I was so grateful that I had maintained something for me all those years. That something — those somethings, friends, knitting, rug-hooking, reading even maintaining my silly blog — fill this new phase of my life very nicely. I still pull out your book at least a couple of times a year to admire your work. Melissa. P.S. my daughter didn’t poop behind a chair, but she did poop in the bathtub once! Sandra, Iam glad you have rug hooking and that you found the studio. What a lovely, honest blog Deanne. At the age of 46 I’m still in the thick of parenting 2 boys 10 and 14 years old. I love your comment about “loving mothering but not parenting”. I completely agree with you. And I think those moments of grumpiness occur at those moments of difficult parenting, not the moments of mothering. Your kids will remember your mothering too! Just might take a few years and perhaps some children of their own! It took me too long to figure out I needed “me” time. I never completely left work after having my kids. Being a nurse allowed me flexibility with a part time work schedule to work around my husband’s work so the kids were never in daycare. My “me” time was when I was at work. But after a few years I became frustrated as I am a paediatric and neonatal nurse and my time away was still spent caring for children, albeit other people’s children, but still children. So I moved on in my career a few years ago to be a a health care educator (still working part time to allow me to be with my kids). Shortly after my Dad became sick and died 6 months after that. It was then that I realized life is too short to keep putting off those things you want to do. When I stumbled across your studio while on our family vacation in NS and you sat me down at your frame to teach me how to hook I knew right then I had found something special just for me. I am so grateful for the door you opened up for me. I still don’t find as much time as I would like to hook, but I leave my frame out where I can look at what I’m working on, think about it, follow your blog and take your courses. Thank you! Truth, face on. Life is what it is, and the young should be aware of it. Thank you! A great blog on Mothering Deanne. One wonders if there is anything else out there, when you are running after your kids. My two sons were born 14 months apart, OMG nobody said it was easy! Now at almost 82 I find myself reflecting on the past, the stories I could tell..At 40(ish) I found myself, (as they say). The boys went off to school, the empty nest at last.LOL. My husband was doing his thing after work, why not me. I became independent. Taking up Rug Hooking, Yoga.Knitting and selling designer sweaters. Later years at 59 I became a Fitness Instructor at the Y.M.C.A. Joined a group and went off Hiking mountains in Europe. As the years go by my sons, who live out of town, are in touch with me constantly. We all get together annually. Their Dad is no longer here. I can’t imagine what life would be like with out children, grandchildren. To be a MOM is the greatest!!!! Deanne, I loved your post and appreciate and respect your genuine and authentic words on raising a family. I cannot say that I chose that path, but instead travelled a road of an all-consuming career, finding little time for my own personal desires in the art world. But, like you, in between the long hours, I tried to hang onto the few moments for myself dabbling in the art I love. But thankfully, those long hours have allowed me the ability now, in my third chapter of life in retirement, to pursue my own creative adventure in the art world, hooking and painting. You have spoken about the quiet moments in the day that you allowed yourself while raising your family, and it brought me back to quote that I read in “The Painters Keys, a newsletter published weekly by the artist Robert Genn. He says that art provides “partial and limited time in isolation and is how we reset the compass of our souls”. He also says that “artistic quiet time anchors ourselves and brings us eventually to the wisdom of reconnection” with others. I have found this to be so true and important to me as a person. Thanks for your notes on mothering. They are nice to hear. Incredible post, Deanne. As a wife, a mother of 5 boys, all who have left the nest, and a daughter of ailing parents when our children were young I certainly can relate to much that you speak of. We kept all our sons active in Hockey, Soccer, Track and Field and the Scouting movement. It was quite a roller coaster all those years as my husband and I volunteered in every sport, etc. that our children were participating in and I do not regret anything ( other than maybe being somewhat grouchy at times). Now , aside from work, I can spend time at trying to be as creative as I can. Our sons and their loved ones live all over Canada ( one recently moved back to Newfoundland from Texas with his young family) and we are delighted. The remainder make trips home once a year to the ol’ homestead. I thoroughly enjoyed reading your answer to Carrie. Thank-you for sharing this with us tonight. 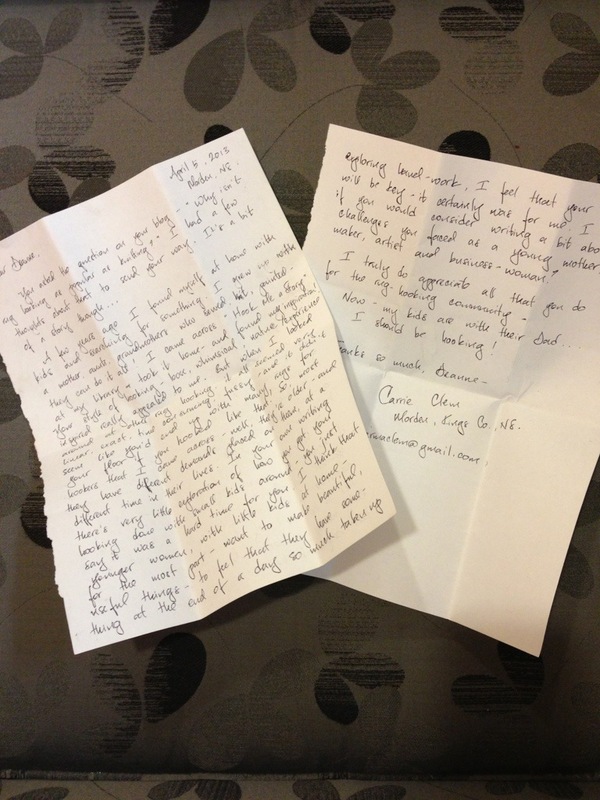 A sweet letter, and an answer that speaks to all of us…not sure how we managed to keep it together most of the time…I lost my first husband early on and also regret being cross with my children at that time…I often stayed up way late to work on some needlework…it fed my soul and prepared my spirit for the next day. I didn’t remember the Khalil Gibran quotes, but Harry Chapin can still bring me to tears. My children were fortunate enough to have a second Dad who loves them like his own…our son tells him to this day that some of the stuff he (Dad) used to say makes a lot of sense now! Mothering like all relationships is a dance of coming together and being alone. As a young mother with five children my creativity leaked out in the day to day reality of messy family life. Making sandwiches for school was boring so I made hippopotmus and koala sandwiches. Washing the floors was just a chore until one hot summers day we washed it by ‘swimming’ around it in our bathers. But mostly those days seemed like they would never end and the mess would never be cleaned up, but like you Deanne, being present was one of the most important aspects of mothering for me. In order to be present I also needed time alone and reclaimed the evenings as space to re-create in, after all, they tell us on flights to put our own oxygen mask on first before we assist others because without oxygen we aren’t much use to anyone. Good thoughts , Susan, thanks. Deanne, what a great post. A little less about hooking and a little more about life, but still so important. I didn’t have any children of my own, although I did raise a step-daughter from the age of 2 and believe me, I understand the pain you experienced, but since mine was a step-daughter, probably with more intensity. But where your post really spoke to me is about my future life. My husband is 20 years my senior and is retired and not that healthy any more. I tend to be a worrywart, and my concern is losing my husband. I wonder what my life will be like once that happens. 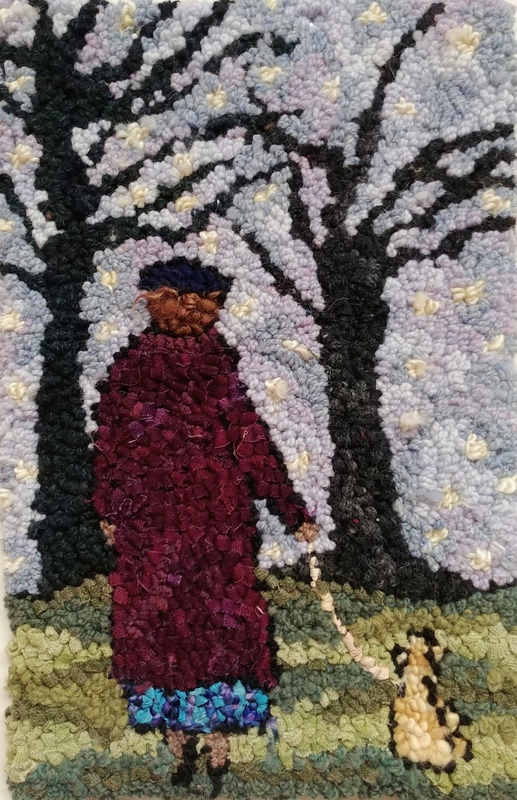 So I have pushed on, insisting to keep my rug hooking and my outside friends in my lives even when my husband would probably rather just have me to himself. Yes, I agree with you about keeping these things going in your life. The things you are passionate about will likely bail you out of potential unhappiness at some point in your life if not. At least that is my theory. Amen sister! I too was home with my kids until the youngest went to kindergarten. I remember when he started to go to kindergarten we lived in rural Quebec where it was all day Monday, Wednesday and every second Friday. Once that bus left it was my creative time. Now that it’s all my time I miss them but enjoy their visits even more so.